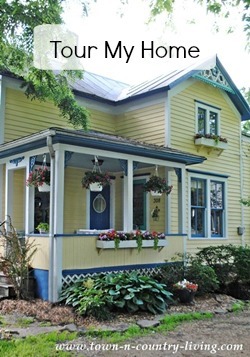 Spring is definitely in the air here in the Midwest and I’m celebrating the start of the season with a few of my favorite bloggers from both the U.S. and Canada! 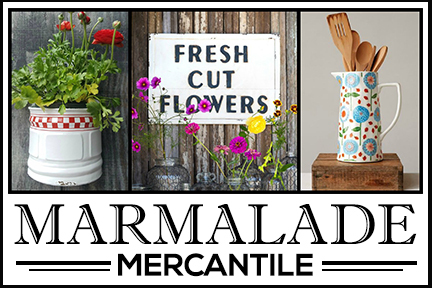 (You’ll see links to their inspirational spring decorating at the end of the post.) I was in the mood to create a spring tablescape in my breakfast nook but what I ended up with looks entirely different than what I envisioned in my mind. Does that ever happen to you? I was going to infuse aqua and pink into the space but as you’ll see … that didn’t quite happen. 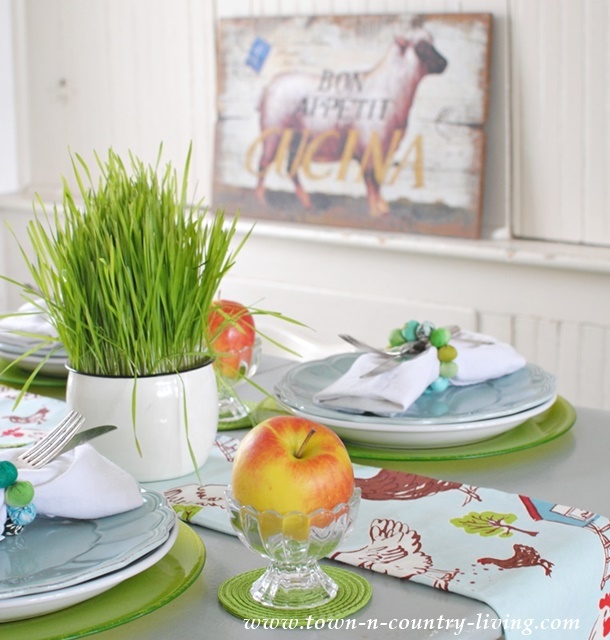 The spring color scheme for my breakfast nook ended up being green, aqua, and a few touches of red thrown in for fun! It all happened quite unexpectedly. I was in Crate and Barrel and stumbled across these adorable farmhouse style kitchen towels with roosters and chickens. As I was getting ready to style my spring table setting in pink and aqua, it dawned on me to fold my new kitchen towels in thirds and place them end to end to create a makeshift table runner. I fell in love and there was no turning back! 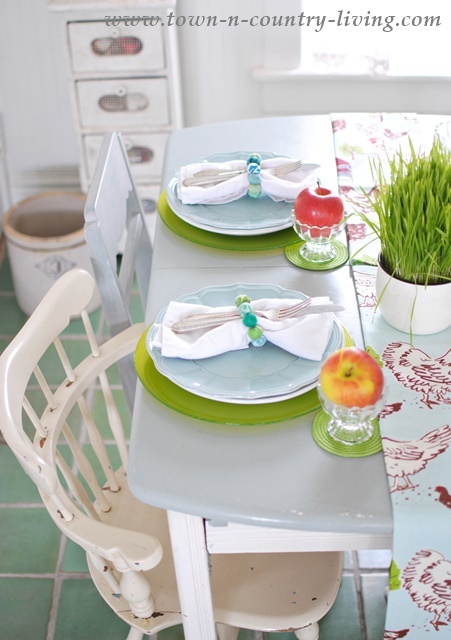 My little wheat grass plant covers up the “seam” where the two kitchen towels meet in the middle of the table. Sometimes I’m amazed how a simple solution can feel so genius (at least, I was feeling pretty smart over my new found resourcefulness). 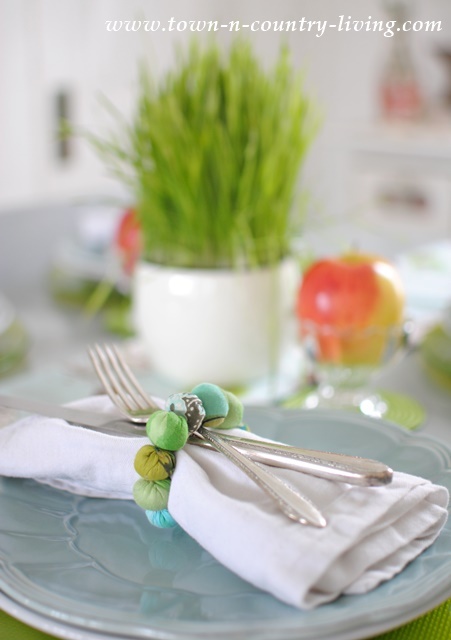 I found these cute napkin rings on sale while I was at Crate and Barrel and thought the colors would be perfect for my spring tablescape. 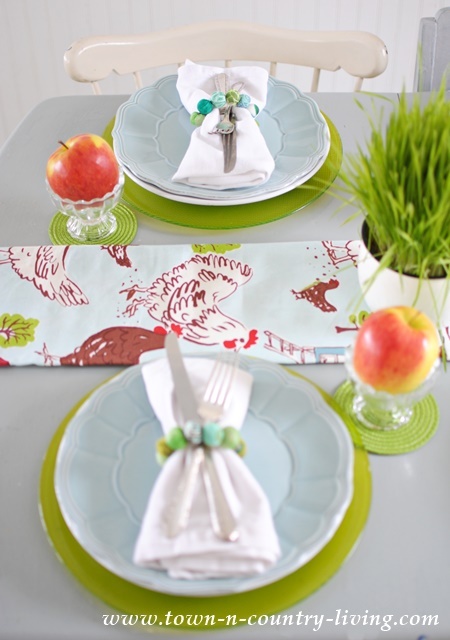 At the time, I was still thinking pink and aqua, but they ended up matching my kitchen towel table runner perfectly! From the beginning, I knew I’d use my pale aqua plates. 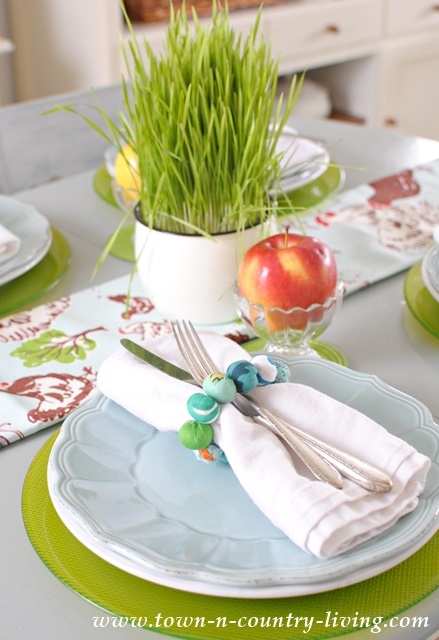 To pull out the green in the table runner, I hauled out my green chargers that I used for my modern country table setting. Pink was now definitely out of the question. And red was in! I had every intention of putting a scoop of pink-hued strawberry ice cream in these cute ice cream dishes. 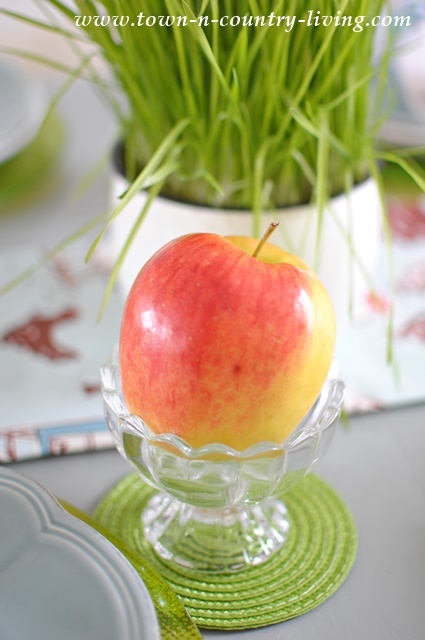 Instead, I opted for apples since my makeshift table runner had a few touches of red. The green coasters were also on sale at Crate and Barrel for just 37 cents each. Honestly, I think I like this color scheme better than the one I had originally planned, even though I love the color pink. But there’s just something about the aqua and green that’s pulling at my heart strings. 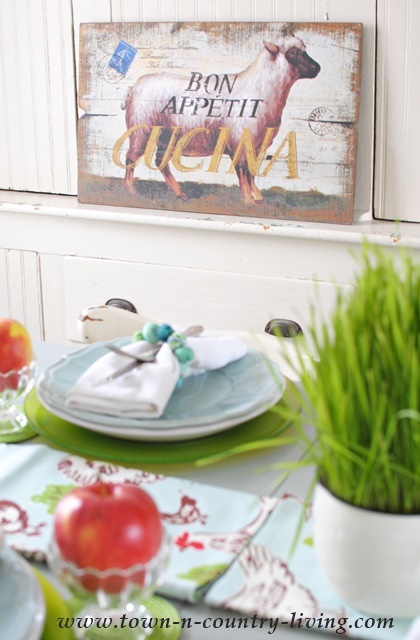 My little Bon Appetit lamb sign adds farmyard fun to my spring breakfast nook. 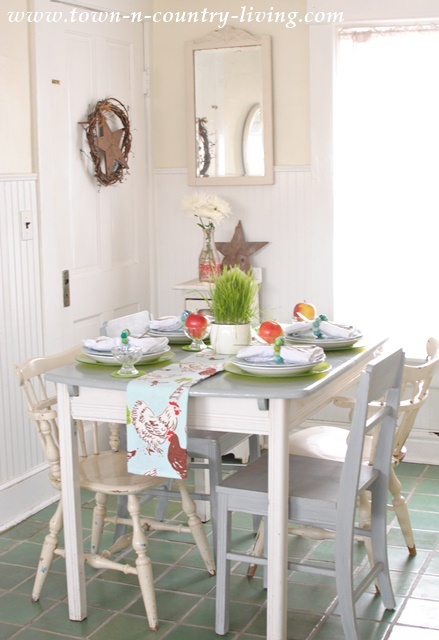 Mismatched chairs also enhance the vintage farmhouse look at my spring table. 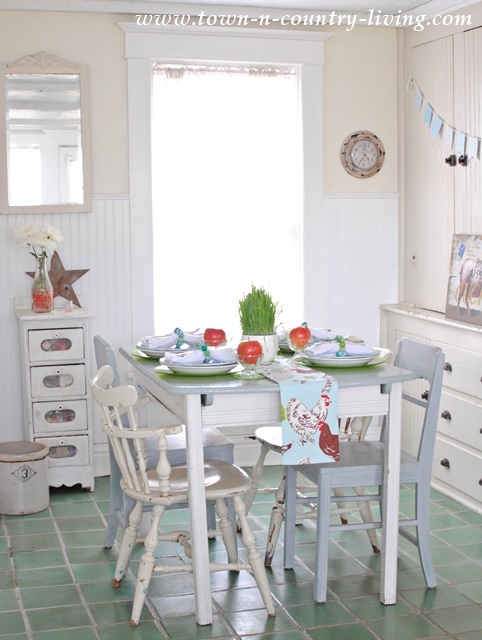 I’m inspired to introduce a few more barnyard friends to my farmhouse dining nook. For now, I’ll just enjoy the spring freshness of my green and aqua color scheme! 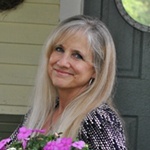 Visit my blogging friends at the links below for more spring inspiration! Cute, cute, cute! I love all the bright, happy colors. Your dining nook is beautiful, Jennifer. 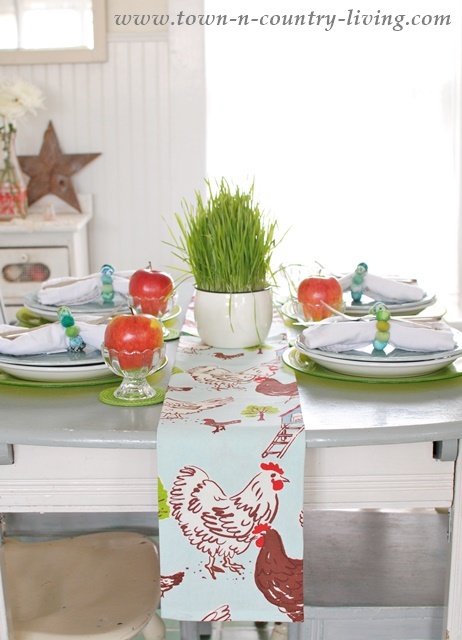 I love the farm style decor, especially the table runner, since I am really partial to poultry! Your tablescape is precious. I too have used tea towels for a table runner. I wanted a striped red grain sack/linen look for Christmas and found what I was looking for in a tea towel from Crate and Barrel. I sewed two together at the middle and voila, my table runner for my kitchen table (PS no side seams necessary either). I usually have a centerpiece, as you have, so the seam is not noticeable. Always so beautiful. Love your tablescapes. where did you get your bon appetite lamb sign? I love it! Very cute and pretty for Spring. 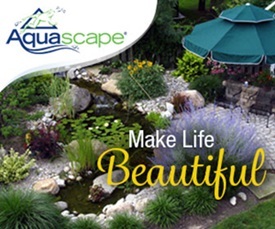 I wholeheartedly agree about aqua and green for the win! This setting is so fun! This really speaks to the artful eye you have to put together pieces that most people wouldn’t think of, in such a beautiful way. So adorable!! 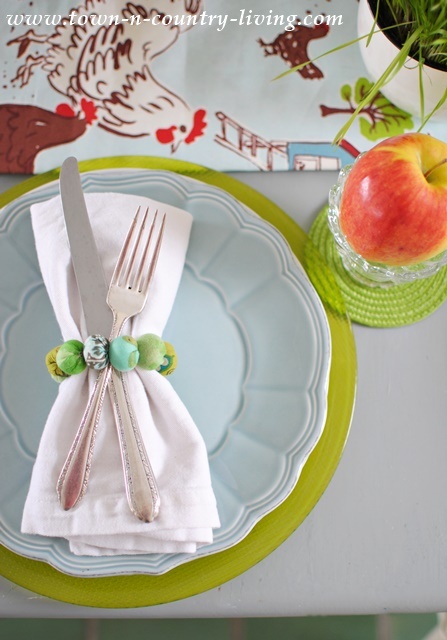 I love your “table runner” and your plates go with it perfectly! What a perfect place for a spring meal!